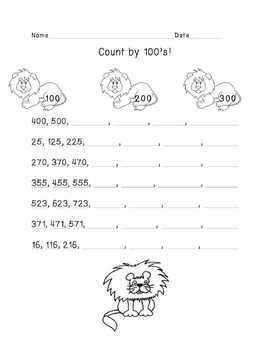 Counting Animal Worksheets- Counting by 1's, 10's and 100's. 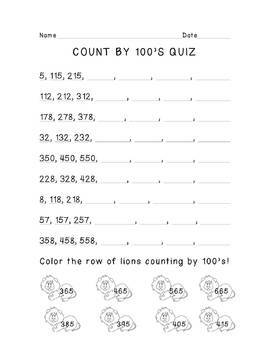 This is a set of counting worksheets and quizzes to reinforce counting by 1's, 10's, and 100's for your students. The worksheets are themed with different animals to help them differentiate between counting methods. Counting by 1's are birds, counting by 10's are elephants, and counting by 100's are lions. The 100's worksheet and quiz are in the thumbnails for you to preview. The other worksheets and quizzes look similar. There is no counting by 1's quiz. Enjoy!